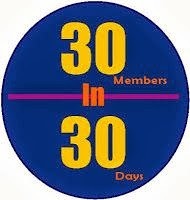 We are nearing the end of our 30 Members in 30 Days campaign at Northern Colorado Writers, and we haven't quite reached our goal. I'm not worried, because I have faith that everyone who reads this will visit the NCW website and sign up for either a Standard or Professional Membership. Plus, I know where you all live, so I can always fall back on a visit, a meal, and possibly staying over a few days. I like my towels fluffy and eggs runny. Or is it the other way around? This isn't a game show. Johnny: Well, Rich, life is a game show. Wow. That's pretty astute for someone like yourself. Johnny: I got it from the back of a Lucky Charms box. Johnny: I'm not just a pretty face, you know. Time to make my getaway. Here's are some quotes and testimonials from our current NCW members. “Northern Colorado Writers has influenced my writing in a number of ways, but most importantly by facilitating my interactions with other writers whose work I admire and frankly emulate. For me, it’s all about relationships, and NCW has offered that as well as constant encouragement to do my best.” -John Paul McKinney, author of Charlie's Angle. "Through the NCW’s classes, workshops, and support, I’ve received so much valuable information and skills which I feel led me to a publisher for my book. Being connected with so many great writers who just want to learn from and support one another is one of the reasons I love being a member." -April Moore, author of Folsom 93. As you can see, Northern Colorado Writers has influenced many folks to pursue their writing dreams. You can be one of these folks if you join or review your membership. And do it before Johnny mistakes me for a pan of a Jiffy Pop popcorn.